In the middle of a long, cold, snowy winter, there's nothing like focusing on a few summer catch phrases to put you in mind of warming, sunnier days ahead. Writers and artists especially sigh for what summer means, and they sum it up in summer catch phrases. Those are great ways to keep those long summer days alive through the cold, dark winter! But summer loves have a special way of blooming, and being remembered, by anyone who was ever young and in love. Something about the warmth of summer and the elegant summer nights seems to nurture and cherish those summer romances, the memory of which can easily last a lifetime. "These are the forgeries of jealousy; And never, since the middle summer's spring, Met we on hill, in dale, forest, or mead, By paved fountain or by rushy brook, Or in the beached margent of the sea, To dance our ringlets to the whistling wind, But with thy brawls thou hast disturbed our sport." The Bard truly can't be beaten for romantic summer catch phrases! "Love is to the heart what the summer is to the farmer's year - it brings to harvest all the loveliest flowers of the soul." "The shepherds shun the noonday heat...To closer shades the panting flocks remove; Ye gods! And is there no relief for love?" "Let those love now who never loved before; Let those who always loved, now love the more." "I know I am but summer to your heart,and not the full four seasons of the year." "I love you not only for what you are, but for what I am when I am with you." "How do I love you? Let me count the ways" - words obviously penned by the round white light of a full summer moon. 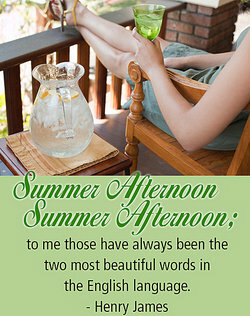 "Summer afternoon - summer afternoon; to me those have always been the two most beautiful words in the English language." "Summer Catch Phrases." YourDictionary, n.d. Web. 20 April 2019. <https://quotes.yourdictionary.com/articles/summer-catch-phrases.html>. In the middle of a long, cold, snowy winter, there’s nothing like focusing on a few summer catch phrases to put you in mind of warming, sunnier days ahead.Golfer James Dent knows all about warm, sunny days, especially in his profession. But that doesn’t mean he wasn’t able to sum up what, to him, is a perfect summer day:“A perfect summer day is when the sun is shining, the breeze is blowing, the birds are singing, and the lawn mower is broken. "Novelist Albert Camus put it more poetically:“In the depth of winter, I finally learned that within me there lay an invincible summer.”Writers and artists especially sigh for what summer means, and they sum it up in summer catch phrases.“There shall be eternal summer in the grateful heart.” - Celia Thaxter“The summer night is like a perfection of thought.” - Wallace StevensThose are great ways to keep those long summer days alive through the cold, dark winter!